Today has been my last day of work before my one week and a half break. Let's celebrate it with a casual outfit that makes me dream about sunny California !. In these pics I am wearing a canary yellow t-shirt from Camp Beverly Hills, the first classic American sportswear brand born in 1977 in Rodeo Drive, Beverly Hills. Camp Beverly Hills tees were collected and worn by a young Drew Barrymore, Barbara Streisand at the height of her fame, Jane Fonda at her legendary fitness studio and scores of other stars. I am very demanding with quality when it comes to sportswear clothes and I have fallen in love with this brand also for the quality !. Oggi è stato il mio ultimo giorno di ufficio prima di una pausa di una settimana e mezzo. 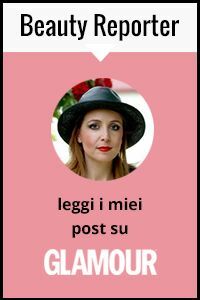 Per l'occasione, ecco un outfit casual che mi fa sognare la soleggiata California !. 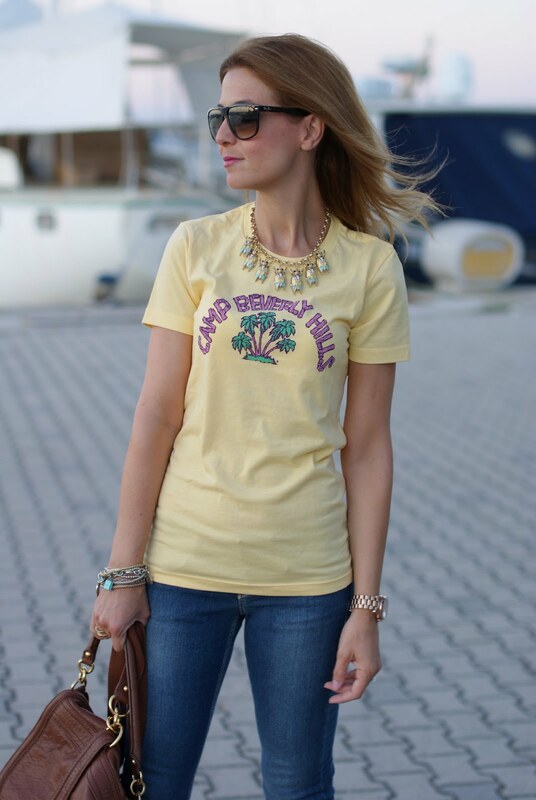 In queste foto indosso una t-shirt giallo canarino di Camp Beverly Hills, la prima marca di abbigliamento sportivo americano, nata nel 1977 a Rodeo Drive a Beverly Hills. Il logo originale è stato riproposto per il 2012 ed è molto conosciuto negli USA. Infatti, le t-shirts di Camp Beverly Hills sono state indossate da star americane come Drew Barrymoore, Barbara Streisand all'apice della carriera, Jane Fonda nel suo leggendario studio di fitness e tante altre stars. Sono molto esigente quando si parla di abbigliamento casual e mi sono innamorata di questo brand anche per la qualità !. I am wearing jeans from Latinò, yellow pumps and my Juicy Couture backpack bag bought in NY. I am also sporting a Zara beetles necklace which is weird to me because I am really insects phobic and I have to confess even tho I love it, it felt a bit weird to wear that around my neck, LOL !. Indosso jeans di Latinò, pumps gialle e la borsa modello zaino di Juicy Couture. Ho al collo una collana di Zara con ciondoli a forma di scarafaggio il che è strano per una insettofobica come me...devo confessare che sebbene mi piaccia, mi ha fatto uno strano effetto metterla intorno al collo, LOL !. You can see a set I made for this outfit above. Now I am off to keep working on the flat, as many of you know we're in the middle of a big remodeling...I am blogging from another room right now and it's very nice, we even put a big New York canvas on the wall, I am gonna show you some pics soon when it's all done ! I have a massive DVD collection and now the couch seems more inviting than ever...even tho I enjoy going out so much that I don't know when I am finally gonna rest ;-). Sopra potete vedere un set che ho creato per questo outfit. Ora vado a continuare i miei lavori in casa, come molti di voi sanno siamo alle prese con una grande ristrutturazione...ora sto "bloggando" da una stanza diversa e sta venendo molto bene, abbiamo anche un enorme canvas rappresentante New York sul muro, vi farò vedere presto qualche foto non appena tutto pronto ! Ho una grande collezione di DVD e ora il divano sembra ancora più invitante...anche se mi piace così tanto uscire che non so quando riuscirò ad approfittarne ;-). Simple, yet very interesting and stylish casual outfit! Simple and lovely outfit. Love yellow shoes and your t-shirt. Il giallo ti illumina molto e ti sta davvero bene. che carina la maglietta! come anche lo zainetto! buona settimana e mezzo di riposo e buon ferragosto! :) un bacio! vale, what a fun casual outfit! i like how you dressed it up with the heels, insect necklace, & purse. :) enjoy your vacation. i'm curious to see what the new york canvas looks like. I have been looking for a bag for travel and big enough for my iPad too!! I love this option you're using!! such a casual FUN look! love how you added the pumps to glam up the look! I hope you have a great break! Love the laid back vibe of this look! Mi piaci molto in questa versione! great outfit, love the yellow heels! Look very nice !! Like all the pics !! Camp Beverly Hills was my favorite movie growing up! I had no idea it was a clothing line too! Cool! The pumps are beautiful! I love the color! Pretty and kind of a retro vibe to it. Love! Ciao tesoro, bellissima ed impeccabile come sempre! :) Dove andrai in vacanza?! Buon divertimento allora! E rilassati più che puoi, eheh! Love this bright yellow court shoes! And I am in love with your last outfit post head to toe! Of course we can follow each other! I really like your blog! In fact, I was already following you on facebook and bloglovin! I just added you also on my GFC! this is such a cute look! enjoy your vacation and time off! Hello, the look is great!! I love your outfit!! You look stunning!! Thanks for your lovely comment. It will be a pleasure to follow each other. I follow you, follow me back? cute shirt! I love the yellow heels too! You look fab! Love the jewelry! I'd love to follow each other! Already followed you via GFC, Bloglovin and on Twitter! Hope you'll do the same so we can stay in touch!! Thank you for your comment!! We are so sorry about we cannot ask you earlier, but we have had several exams and we cannot do something in our blog :(. We two love your t-shirt!! Grazie mille per essere passata da me, ti aspetto di nuovo! I love this look on you, casual yet very chic! I especially love the yellow pumps and your necklace, gorgeous! Enjoy your break and all your remodelling! Can't wait to see the outcome!! you seriously have the best accessories ever! love that necklace! enjoy the vacation!! !